Station’s Archived Memories (SAM) is a volunteer-driven project to preserve the history of Rocky Mountain PBS. In the 1990s, Rocky Mountain PBS hosted an extremely popular series of community lectures known as “An Evening With. . .“ It was an exceptionally inspiring series featuring respected and popular icons of PBS. The series presented the community with such renowned guests as Jean-Michel Cousteau (1990), Ken Burns (1991), Mark Russell (1991), James Burke (1991), Louis Rukeyser (1991), Les Brown (1992), Shelby Foote (1992), Maya Angelou (1993), Judith Reichman (1994), Jane Goodall (1994) and Bill Moyers (1996). 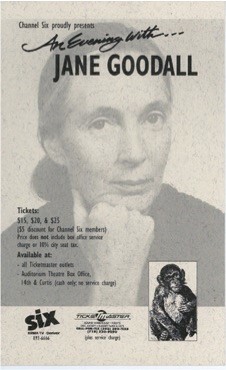 On April 12, 1994, Dr. Jane Goodall was the ever-popular guest for the “An Evening With . . .” series at the DCPA Auditorium. Dr. Goodall, a longtime friend of PBS had, at that time, just celebrated thirty years of continuous field studies of chimpanzees. The audience discovered much more than her knowledge of chimps. She also shared her passions and visions for the human kingdom as well as the animal kingdom. Her newest program, at that time, was “Roots and Shoots” to help young people value themselves, each other and all living things. Today, the Roots & Shoots program continues to foster respect and compassion for all living things, promote understanding of all cultures and beliefs and to inspire individuals to take action to make the world a better place for people, animals and the environment. Roots and Shoots clubs of young people from pre-K through college were launched in countries throughout Europe, Asia and the Americas. Dr. Goodall proved to be a very personable speaker who cheerfully autographed programs after the lecture until the very last person had been personally greeted and thanked. 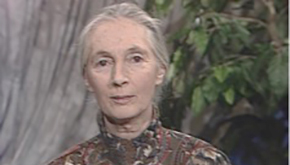 Rocky Mountain PBS and the volunteers of Station’s Archived Memories extend a very Happy Birthday wish to Dr. Jane Goodall who turns 81 on April 3, 2015.